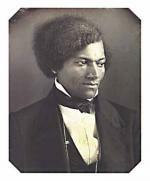 This 1848 daguerreotype is a rare image of Frederick Douglass as a young man. The meeting between Frederick Douglass and John Brown was supposed to be secret, but the black abolitionist was so famous that he was immediately recognized upon his arrival in Chambersburg. He went to a local barbershop, where he met the man who guided him to the quarry. There he found Brown waiting, disguised as a fisherman. Douglass opposed Brown's plans not only because they would be "fatal," but also because he believed the raid would turn into a political catastrophe. "It would be an attack upon the federal government," he argued, "and would array the whole country against us." Brown dismissed these objections, claiming that "something startling was just what the nation needed." Brown and Douglass had first met and become friends in Springfield, Massachusetts in the late 1840s. Douglass recalled that even in those days Brown was talking about how a small band of men might conduct raids into Maryland and Virginia to help slaves escape. By the time Brown was captured, Douglass was already out of the country, temporarily in Canada before he was scheduled for a journey to England. Some fellow abolitionists accused him of cowardice. He responded stiffly, "Let every man work for the abolition of Slavery in his own way." Frederick Douglass, Life and Times of Frederick Douglass (Hartford, CT: Park Publishing Co.), 1881. Benjamin Quarles, ed., Blacks on John Brown (Urbana, IL: University of Illinois Press), 1972.